The accelerated convergence of bio-computation is ushering us into a new Material Age, an age driven by creativity and environmental sensibility. The technology we build and use is getting more and more similar to nature, while at the same time the studies on nature expose it more and more as a form of technology. Computational design has reached the micro and nanoscale and material systems are becoming the new language of designers thanks to the potential of additive fabrication techniques. We are now beginning to design and build/grow materials and applications, by employing living systems. Biofabrication, a definition originally coined in the biomedical field, is nowadays a term used to describe a branch of manufacturing where future consumer products are designed and grown harnessing biological organisms. This is a new design paradigm centered on cultivating materials with living cells, achieving novel functional and aesthetic properties. Bio-fabricated materials share one key element: life. And with life, they can be endowed with one or more of its defining processes such as self-organization, adaptation, self-repairing, chemical transformation and metabolism, adaptive behaviors (such as changes in local material production to balance stress peaks). We’re starting to re-imagine our surrounding world through a biological lens; a lens which is in turn constantly redefined by the technological evolution. Designers cannot ignore the contribution of such scientific advancement, which enables a paradigm shift triggered by the creative potential of contemporary, computation-based design tools, which allows to directly intervene and choreograph the micro-scale morphology and program active behaviors in a system. The design paradigm thus changes from the linear, mono-directional flow connecting abstract conception to post-engineered realization to a process of guided growth where the constraints of material and production systems are embedded in the initial interaction behaviors. A possibility triggered by novel specific processes (e.g. 3D-printing). By defining a new balance between the autonomy of an intrinsically rational process and intention, the role of the designer becomes akin to the one of a gardener, the guardian of an unfolding process. A process that can, to a certain extent, be directed while preserving its own operational autonomy. BIO Ex-Machina is a trans-disciplinary, design research project aiming to join computational design, biological growth, additive fabrication and robotic protocols for the design of customized, on-demand objects, as hybrid eco-systems. Along the development of the project, the team will explore design strategies by programming specific morphogenetic processes and robotic behaviors for the synchronized deployment of substrates and living materials (e.g. fungi). Combining the unique potential of computation, robotics and biological building agents temporary scaffolds capable of supporting cell growth will be algorithmically designed and fabricated; those will be colonized, progressively degraded and transformed by living organisms. 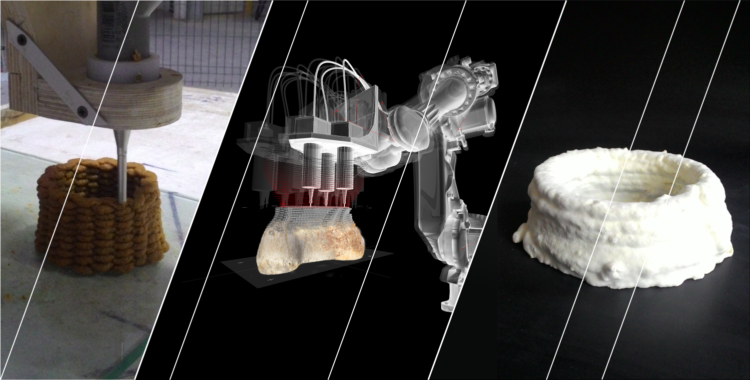 By implementing a 6-axis robotic arm with a custom designed extruder, the project’s ambition is to develop a process for printing diverse typologies of scaffolding structures, while simultaneously deploying the living organisms as main transformation agent. The primary aim of BIO EX-MACHINA is in fact to design hybrid artefacts as ecosystems combining algorithmic design strategies, material behavior and living organisms, while exploiting manufacturing processes made possible by the use of robotics, therefore developing hybrid growth protocols (i.e. Bio-4D-printing). The project’s intent is to outdo the current state of inanimate objects and shallow replication, where physical is a perfect copy of the digital, by letting fabrication and colonization become an integral part of the design process, allowing new physicalities and aesthetics to arise. Design and creation will here become a dialogue between systems, which are capable of autonomous decisions and of computing (programs and living cells alike) allowing us to study how they can openly interpret given conditions. We expect the final outcomes (living artifacts) to incorporate qualities that will hopefully bring to life new forms and methods for conceiving user interaction. Building up on the positive experience and early results gathered during the BioLogic project (January 2014), Officina Corpuscoli and Co-de-iT decided to join forces once more, widening their scopes through the involvement of other organizations and research partners such as Officine Arduino, FabLab Torino, Toolbox Coworking, NYXO, ESA (European Space Agency) and Utrecht Universiteit. 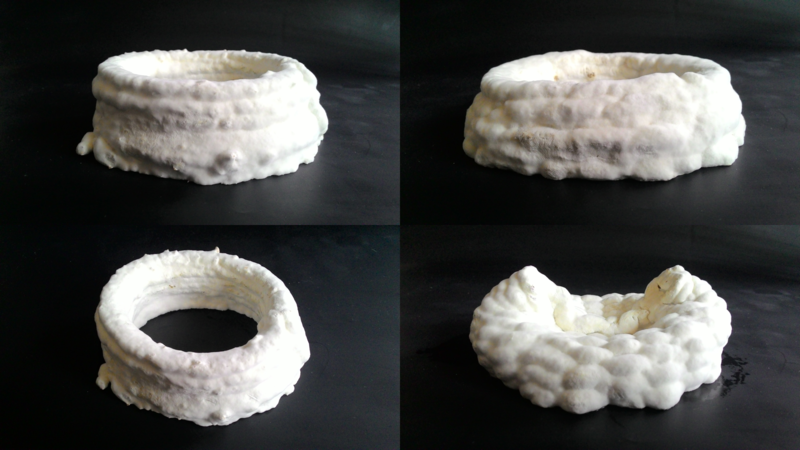 The research conducted as part of the development of Bio Ex-Machina also represents an important input as part of an ongoing, collaborative, research project currently conducted by Officina Corpuscoli, Utrecht University and the European Space Agency (ESA), titled Growing Fungi Structures in Space. Creative, trans-disciplinary practice developing of collaborative, research-based projects. OC develops commissioned and self-initiated projects, often inspired by and in collaboration with living systems and organisms. A network of designers with focus on the impact of computation as design medium in creative approaches combining research, education and networking activities in a unique workflow. A research cluster focuses on computational design, digital fabrication, robotic automation and material research, for the development of applications in the fields of architecture, design and art.
. research and develop a methodology (i.e. bespoke strategy, hardware and software) for printing organic-based materials.
. redefine the interaction of the human body with the designed environment, to open up to the potential of the interaction with living matter.
. widening the access to all specific knowledge involved in the project (computational design, biology, robotics, additive fabrication) by open-sourcing all produced software, hardware and project steps.